R Lipoic Acid, an over-the-counter antioxidant, is a powerful supplement for people suffering from neuropathy. Using Alpha Lipoic Acid for diabetes is a proven method for enhancing nerve cell functioning and relieving common symptoms of numbness, pain, itching and burning in the hands and legs. Alpha-lipoic acid is a nutrient that contains antioxidant properties. The R form, R-ALA, is the only type of alpha lipoic acid that your body is able to absorb thoroughly through the skin. R-ALA is a superior form of antioxidant, as it helps to maintain healthy levels of other antioxidants, such as vitamin E, vitamin C, and Coenzyme Q-10. It also has therapeutic properties in helping to prevent signs of aging and sustaining a normal response to inflammation. Alpha lipoic acid has been the focus of numerous placebo-based studies on diabetic neuropathy, autoimmune disorder, and insulin resistance. For peripheral neuropathy, R-ALA destroys free radicals that trigger common symptoms of painful numbness, tingling, burning, and itching. Alpha lipoic acid may also be helpful for autonomic neuropathy symptoms that occur with diabetes, as well. For diabetes, R-ALA increases antioxidant action and also promotes good circulation in the blood vessels adjacent to your nerve endings. In a famous study, diabetic patients saw improvement after only a few weeks of alpha lipoic acid treatments. Where the placebo group reported little change by the end of the study, the participants who received alpha lipoic acid treatments reported a dramatic decrease in pain symptoms by six points. R-ALA helps to maintain healthy levels of antioxidant vitamins such as vitamin C and vitamin E.
It promotes good nerve cell functioning with diabetes. Alpha lipoic acid is essential for breaking down of carbohydrates and producing energy. R lipoic acid helps to protect your nervous system from harmful free radicals in pollution and chemicals. People suffering from nerve pain have found optimal results with daily use of alpha lipoic acid supplements. Where can I find R-ALA? Alpha lipoic acid occurs naturally in many food items such as meat, but for neuropathy sufferers, it’s important to get more. In many studies, R-ALA is most helpful when dispersed directly into the bloodstream. Nervex Neuropathy Pain Cream contains rich amounts of R-ALA, plus other helpful nutrients that promote good neurological health and relief from common aches and pains. Capsaicin cream for nerve pain is naturally helpful, according to the leading studies on neuropathy treatments. Derived from hot chili peppers, topical capsaicin blocks nerve signals that cause pain and itching. Neuropathy is an illness that causes extreme soreness, imbalance and itching. It’s usually associated with diabetes, multiple sclerosis, pernicious anemia or alcoholism. Peripheral neuropathy is most common, causing uncomfortable numbness, cramps, and tingling in the hands and feet. 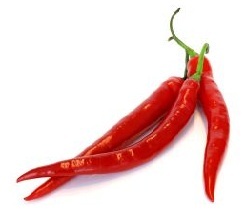 Capsaicin is a natural pain reliever derived from red chili peppers. As a topical cream, capsaicin offers relief for people suffering from neuropathy and arthritis. Capsaicin relieves pain by blocking the skin’s pain receptors. People usually notice a slight burning or tingling sensation the first time they use capsaicin cream. That’s because the capsaicin diverts pain-transmitting chemicals produced by the nerve cells and releases it into your skin. As your nerve cells continue to absorb capsaicin, you will start producing fewer amounts of this pain-transmitting chemical, resulting in long-lasting overall relief. For this reason, experts such as Dr. Karen Lauze, a neurologist at Portsmouth Regional Hospital, recommend sticking with capsaicin cream for at least 6 weeks. Who benefits from capsaicin cream? How do I use the capsaicin cream for nerve pain? To use, simple rub a small amount of capsaicin cream wherever you experience pain or itching. Apply at least 4 times per day for optimal results. Don’t use on broken skin or inflammation. Avoid touching your eyes or nose until after you have washed your hands. Initial burning or stinging will decrease with prolonged use. Oxford University has published several studies focusing on capsaicin cream for peripheral neuropathy. Participants included patients of AIDS, arthritis, shingles, diabetes, and cancer. Forty-one percent of patients favored capsaicin cream for pain relief, compared to placebos and capsaicin patches that were not helpful. In a separate study focusing on fibromyalgia patients, scientists noted significant results in participants who treated tender pain spots with capsaicin cream. Doctors agree that using natural pain relief is the best way to decrease your dependence on unhealthy pain medications. Many vitamins, herbs, and plant-based treatments can effectively nourish your nerve cells from within. Nervex contains capsaicin from chili peppers, Andrographis Paniculata Extract (ParActin®), Thiotic Acid (r-ALA), and vitamins B12, D, and E.
Try Nervex Neuropathy Pain Relieving Cream now. 2Topical capsaicin (high concentration) for chronic neuropathic pain in adults.